Kaitlyn Aurelia Smith’s new album is her own interpretation of the four stages of life. The first stage resembles the first footsteps of a newborn child and is characterised by wonky, stumbling, percussive work. As the record progresses into the later stages of life, intergalactic melodies intertwine with philosophical themes as the ‘kid’ of the album’s title becomes more inquisitive about their world. These themes – of curiosity, of inquisitivity – are ones that Aurelia Smith regularly returns to. Though Kaitlyn Aurelia Smith originates from Washington’s Orcas Island, she has since moved to Los Angeles – a big change for the composer and electronic musician, who’d previously chosen to live outside of big cities. After early forays into folk music (she formed a band, Ever Isles, while studying composition at Boston’s Berklee College of Music), she fell in love with the Buchla synthesiser, going on to release five solo albums and collaborate with one of her main inspirations, Suzanne Ciani, for a two-part release for RVNG Intl. On her sixth full-length, The Kid, she tapped into the penchant for curiousness and wonderment that fuels her own creativity and combined it with studies on philosophical figures such as British philosopher Alan Watts. She also read about different outlooks on life and death in the research stages of making the album – or “different people’s experiences of curiosity, of preference, of aesthetics,” she tells me as she talks over Skype from LA. In the run up to the album’s early October release, Aurelia Smith has made a mix for Dazed which alternates between her own recordings, including her stunning cover of Sade’s “By Your Side”, and music by the likes of cult European-African fusion duo Zazou Bikaye and Tokyo-based producer Sapphire Slows. We talked to the artist about curiosity, the different ways in which reflections can manifest in life and being turned into a glittery cosmos for her new album’s artwork by photographer Tim Saccenti. The artwork for The Kid is really striking, especially the way that the image blends in almost like a camouflage of this glittery cosmos. What went into the thinking of that image? Kaitlyn Aurelia Smith: It was a combo of myself and Tim Saccenti. I was really interested in that image with the glitter face. I made a bunch of Pinterest boards of extreme glitter make-up and had made a whole mood board before Tim and I got together what I felt like some of the colour schemes were for the album – which were these very reflective, galactic, marbled colour schemes. The glitter is playing off of the reflective colour scheme, and I did the photoshoot with Tim and he captured that photo. 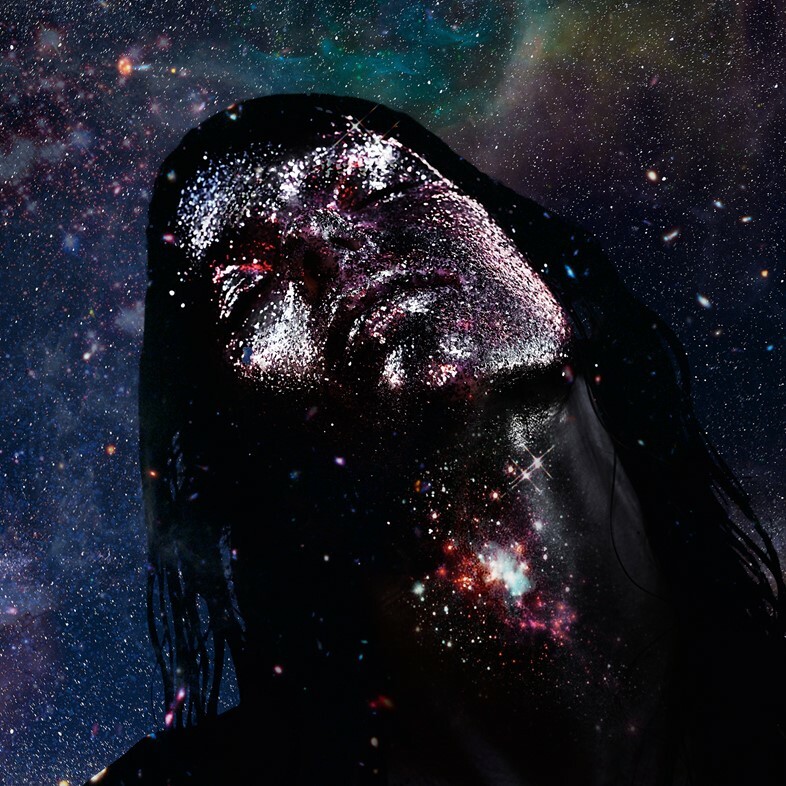 We just felt like it was a very telling photo for the emotion of the album, and so he then exaggerated the galaxy coming out of the throat and the background. The album is called The Kid. What was it about children and that innocent state of being a child that ended up shaping some of the parts of this album? The song title ‘I’m Curious, I Care’ was one that particularly stuck out to me. Has this record come at a time when you feel that you’re questioning more than usual, or is it a constant thing? Kaitlyn Aurelia Smith: It’s always there, and it’s something that’s really important to me in my life, always keeping a finger on the pulse of it. I think moving to LA (had a big impact) because that’s a newer thing for me, to live in a city. I lived in Boston when I went to college, but otherwise I’ve consciously chosen to live outside of cities and in nature. Moving to LA really put me in this environment of feeling like I have all these things I have to do. Life just started moving really fast. So I think it brought it to the forefront of my mind again. Someone that you’ve been inspired is British philosopher Alan Watts. One of his more famous quotes is ‘You’re not there unless you’re recorded.’ Did that line of thinking come into this? Kaitlyn Aurelia Smith: It’s not really a conscious thing. It was more of a reflective thing. I just find it very interesting that it’s an innate human quality that we always seek a reflection (and this goes with the whole reflective visual thing), whether it’s trying to find a partner or to find friends, or to take pictures of yourself or, nowadays, to have social media. We’re always seeking some way to record. It’s more that that quote was very fascinating to me. And just to add onto the reflective theme, the album is also a reflection of a life. In terms of reflecting in terms of life and death, did that make you also reflect on your own life? Kaitlyn Aurelia Smith: Oh yeah, always! I feel like a very salient quality of my personality is constantly reflecting, analysing, adjusting. I find a lot of happiness in that. I think with the motivation of ‘How can I improve something?’ – whether it’s myself, how can I improve this room, how can I improve making this person feel better – I try not to analyse for the sake of analysing, which goes back to that defining thing we were talking about. For me personally, if I can’t define it, then I try and not put too much mental focus on it. There are quiet, soothing sounds on this record and then there are more chaotic, warped rhythms. Kaitlyn Aurelia Smith: Sometimes freeways are calming because it feels like something else is carrying the movement – I don’t have to carry it. It depends on which sound. For me, movement and activity is really calming; having lots of movement and lots of life is another place I find a lot of joy and happiness. But also, it depends on the song and the phase in the life cycle. There was a part in the first half where I wanted it to feel juvenile, awkward, and clumsy – figuring itself out. The earlier songs tend to have some rhythmic parts that are sometimes ahead of the beat or behind the beat to symbolise that feeling in the character of ambition and trying to run towards something and being clumsy and falling back.